Comments Off on What is Shaker Furniture? If you ever connected the dots between Shaker Furniture and the Christian sect named the Shakers, you’re onto something, and What is Shaker Furniture? will complete the picture. Shaker Furniture traces its origins back to the time of the American Revolutionary War (1775-1783). A sect of the Quakers, the ‘Shakers’ came to America to escape the religious turmoil of their native England. The group settled in close-knit, self-sufficient communities along the Eastern seaboard. The early Shakers began making furniture to accommodate large worship gatherings. But Shaker craftsmen built furniture to reflect their devotion to simplicity, practicality and integrity. Plus a strong work ethic. As a result, they used pine wood, because of its light weight and affordability. Also, the Shakers built furniture that was devoid of ‘prideful’ elements. Like inlays, carvings, metal pulls or veneers. In the 1860s, the New Lebanon Shaker community in New York State began producing chairs with the ‘ladder’ back or turned post chairs. Due to the basic design and woven seats, builders could produce the chairs quickly. Soon, people began to take note of the simplistic, elegant designs of Shaker furniture. And began requesting furnishings of their own. The Shaker style grew in popularity. And eventually, it became an iconic contribution to the world of American furniture. In fact, popular forms of Shaker furniture today include Shaker cabinets, tables, chairs, rocking chairs and more. Brandenberry Amish Furniture offers a huge selection of Shaker furniture — for every room in your home. But Shaker furniture from Brandenberry is different from what you’ll find in most popular chain furniture stores. This is because skilled Amish artisans painstakingly craft each item of Shaker furniture. Plus, the Amish men use solid hardwoods along with old world construction techniques. 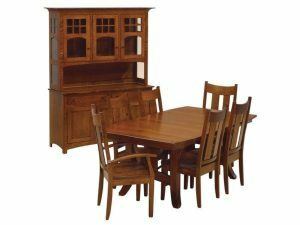 Visit Brandenberry Amish Furniture in Shipshewana, Indiana, and see, touch and experience Shaker furniture for yourself.